This article ran in the March issue of Waste Today. The author is the editor of Waste Today and can be reached at aredling@gie.net. Handling construction and demolition (C&D) material is a dusty job. Between things like broken drywall and crushed concrete, C&D material can kick up dust in unwelcome places when tipped in a processing facility, leading to a number of potential safety hazards. Dust can carry various contaminants, and as safety regulations around the country become more stringent, it’s increasingly important to keep those contaminants to a minimum not just for safer operations, but also to keep operations up and running. It’s a challenge California Waste Services (CWS) has been dealing with since it opened its C&D waste processing facility in Gardena, California, in 2000. The company began operations solely as a roll-off dumpster hauling company in 1999. But as a new California law requiring 50 percent of a municipality’s waste stream to be diverted from sanitary landfills moved through legislation that year, the owners realized that they would need to integrate C&D material recycling into their operations to remain relevant. It became the first C&D processing facility to open in Southern Los Angeles County. Since then, CWS has used forward-thinking dust suppression techniques and equipment, combined with some lessons from experience, to efficiently mitigate dust while avoiding citations in the process. CWS’s open-air tipping area sits on about six acres of land. The facility is permitted by the California Integrated Waste Management Board (CIWMB) and CalRecycle to accept 1,000 tons of C&D waste a day, including separated wood waste and drywall, along with mixed C&D materials that can include metals, insulation, roofing, concrete, bricks and more. CWS now maintains about 95 percent capacity daily, Casper says. More than 80 percent of all C&D waste delivered to the recycling facility is sorted into separate, reusable commodities. But shifting those materials around can often get dusty. “The whole area is a dusty operation. Everything we do is dusty. It’s what we’re most concerned about,” Casper says. CWS has a collection operation, but most of its waste is brought in by individuals or other companies. The material is tipped into a large pile where it is then loaded onto a sorting system with an excavator. Screens, magnets, optical sorting, air knives and hand-pickers separate the material to be either processed further at the facility or landfilled. Most commodities are shipped overseas, while concrete is crushed to use on roads, wood is ground for fuel or soil, and drywall is separated and processed to use as manure in California alfalfa fields. As an all-outdoor facility in the middle of neighboring residential areas, commercial properties, a major highway, a large outdoor recreation area and even a nearby hospital, Casper says it’s especially important for CWS to maintain clean operations and keep all the generated dust within its perimeter. In the early days of CWS, Casper quickly discovered the costliness of using hoses as the sole method of dust suppression at his facility. At times, he would need to have a few employees on the clock dedicated just to spraying water over piles of material. Soon after opening, Casper made the leap to a more automated process and hasn’t looked back since. He now uses four FogCannons and a misting system made by Fogco of Chandler, Arizona. “Fogco products are used exclusively and extensively on the property,” Casper says. Casper says his FogCannons operate nonstop from the time he opens at 6 a.m. to closing, which is as late as 10 p.m., seven days a week. A fixed misting system covers the perimeter of CWS, constantly emitting a cloud of fine water particles into the air from several points to trap dust before it can escape the site. 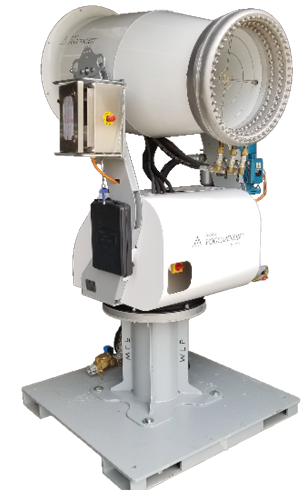 Casper uses the FogCannons at various transfer and tipping points of his facility, which are often the areas most susceptible to dust generation in waste and recycling transfer stations. Shuffling the materials can kick up particles, especially with crumbling or broken C&D materials. When it comes to dust suppression, it’s important to think ahead. Before Casper began using a new conveyor system to exclusively sort drywall last year, he invested in his newest FogCannon, which is now mounted above the conveyor, constantly misting the area to cut down on dust without soaking employees. Casper says he prefers misting systems over the more traditional hoses because they require less time, labor and water. Products like Fogco’s dust suppression cannons use nearly 70 percent less water than standard hoses from water trucks. The system Casper uses is also automated and remote-controlled, so it doesn’t require employees to man, letting them handle other tasks while avoiding harmful contaminants. The fine droplets of water that burst out of the cannon can also be more effective at suppressing dust, as they attach themselves to the particles and drag dust to the ground. “A dust cannon is the most efficient way to mitigate dust because it sends out a microparticle that attaches to the dust particle, and when the two of them combine, gravity takes over,” Casper says. While the Fogco equipment is Casper’s primary method of dust suppression, he reverts to traditional dust control methods in certain areas and situations. Casper keeps extra hoses on hand for the especially windy days, too, when a fine mist is no match for rushing gusts. Pairing high winds with dusty loads creates an issue that is best solved with the heavy streams of a trusted hose. Though the water atomizing technology used by Fogco has been around for years, it is something that’s just now been increasing in popularity in waste processing facilities around the U.S. as dust regulations have become stricter, Amparano says. In 2016, the Occupational Safety and Health Administration (OSHA) issued its final silica standard for industries, amending its silica exposure levels for the first time since 1971. Long-term exposure to crystalline silica, which can be found in brick, concrete, drywall and many other construction materials, has been linked to various health issues. When those materials are disturbed, as they are in facilities like CWS, exposure to this dust can pose significant health risks to employees, including silicosis, lung cancer and more. The new rule, which Casper says will begin affecting him this year, cuts the Permissible Exposure Limit (PEL) of silica in half compared to the previous regulation. Casper says he will need to remain especially mindful of the new rule when processing concrete, which can contain silica. While the stricter enforcement will require more stringent operations, Casper is confident he has the right equipment and methodology in place to maintain his clean track record. This article originally ran in the March issue of Waste Today. The author is the assistant editor of Waste Today and can be reached at tcottom@gie.net. Unilver, Nestlé, Coca-Cola and Carton Council of North America support the launch. The Recycling Partnership, Falls Church, Virginia, has launched the Circular Economy Accelerator, a new initiative that is designed to proactively drive policy solutions for stronger recycling and a robust circular economy in the United States. The Circular Economy Accelerator will build consensus for attainable policy and legislative solutions at the state and federal level to secure sustainable funding, incentivize recycling over disposal and expedite public-private solutions for circular systems, the organization says. The accelerator is launching with support from more than a dozen of the biggest brands, material companies and organizations committed to taking action to advance the circular economy. For the last half-decade, The Recycling Partnership has partnered with more than 1,000 communities, putting carts on the ground, working with recycling professionals from across the country to improve operations and get contamination out of the recycling system. The Circular Economy Accelerator provides another powerful tool to help deliver that change, the organization says. Unilver, Nestlé, Coca-Cola and the Carton Council of North America have made the following statements in support of the accelerator. Norway-based company hopes new route will encourage more German manufacturers to bale, export waste. Norway-based company Geminor says its first shipment of baled, refuse-derived fuel (RDF) has arrived from Germany to Sweden. In April, a ship carrying 100 tons of baled RDF reached the Copenhagen Malmo port in Sweden. The arrival of the waste generated in Germany to the Swedish waste-to-energy SYSAV plant “constitutes a milestone for German waste export” and marks the start of a two-year 20,000-ton contract between Geminor and Germany-based pulp and paper manufacturer SCA, the company states. The SCA-owned ferries transport paper from Sweden to Europe. “We are at the moment assisting secondary fuel producers in the preparation process and believe that the newly established route to Sweden will encourage more German waste producers to bale waste for export,” Mernelius says. Geminor, founded in 2004, describes itself as a leading player in the European secondary fuels market, handling more than 1.4 million metric tons of feedstock annually and holding contracts with more than 80 waste-to-energy facilities.